Mold is a eukaryotic micro-organism. This means it's different than plants, while still being a plant-like organism. The primary purpose of mold is to decompose dead organic material like leaves, plants, and wood. Mold can find its way into almost any environment, even dark ones as it does not need photosynthesis to survive. Any form of microbial growth that forms in the indoor environment is a cause for concern as it can affect the respiratory health of the occupants. Mold spores are everywhere outdoor and indoor; mold spores only become a problem when the spore count level is higher inside than it is outside. This is determined through mold testing using air samples. In many cases, mold makes itself visible by growing on your drywall, around your air vent covers, or on the joists of your crawlspace. If a mold has made itself known, or you suspect a problem is brewing somewhere in the home, but you're not sure where call AdvantaClean of Des Moines Central today to schedule a mold inspection or mold testing appointment. We'll determine the source and extent of the problem and begin mold remediation right away. WHERE ARE COMMON PLACES TO FIND MOLD GROWTH? WHEN SHOULD YOU BE CONCERNED YOU HAVE MOLD GROWTH? Did you just look up at the ceiling in your bathroom to find black spots above the shower? Or maybe you went down into the basement for the first time in weeks only to receive the nasty shock of green fuzzies on the wall? This is visible mold. Unfortunately, mold isn't always this obvious. A lot of the time, homeowners don't discover the mold for themselves. An exterminator may tell you there's something suspicious in the crawlspace; an HVAC repairman may mention there's mold in the attic; your buyer's home inspector may discover growth in your basement. All of these situations are frustrating to learn about and can cause expensive repairs if left untreated. That's why we highly recommend calling a certified mold inspection and mold remediation company as soon as you learn of it. Sometimes the presence of mold is evident, and sometimes it isn't. In a lot of cases, there are no outward signs of mold growth in the home. In these instances, it may be a smell that first tips you off. It could be a moldy, mildewy or musty odor that either sits in one room or permeates throughout the whole house. It may also only happen when the air is turned on, or when it rains. These are all warning signs that should be heeded. AdvantaClean of Des Moines Central offers non-visible mold inspections and air sample mold testing to determine if your suspicions are correct, and exactly where that pesky mold is growing. It can grow behind a wall, below your feet or inside the ceiling, and always calls for prompt action and remediation. You or someone in your household may have a sudden onset of these symptoms with no probable cause. In this case, it is advised to schedule a mold inspection or mold testing appointment. You will either discover a hidden mold problem or rule out mold completely. Another red flag is if your symptoms are highly agitated while in the home, and abate while you are gone. Our Des Moines technicians are Certified Mold Inspectors (CMI) and Certified Mold Remediators (CMR). This certification enables us to perform mold inspections, mold testing, and mold remediation correctly and successfully. We use the highest standards and provide the best customer service in the industry. General contractors and handymen may try to convince you they can handle the situation themselves, but don't be fooled. If they don't hold a certification for mold removal, the chances are high they will use improper techniques and fail to either remove the mold entirely or cause it to grow back. Mold is serious and requires specialized techniques. Removal should not be attempted by someone without proper training. 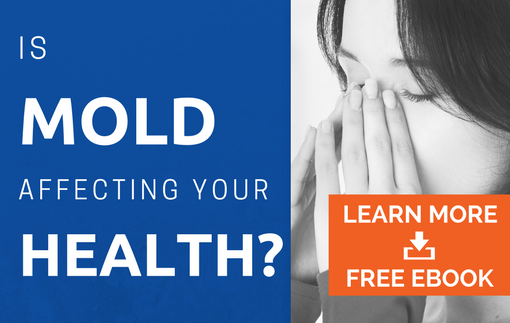 What Are Common Mold Symptoms?